← Fair brings history alive at The Crossing today! I’ve had a couple of comments in today other readers may have missed, so I thought I’d pull them out into a post. 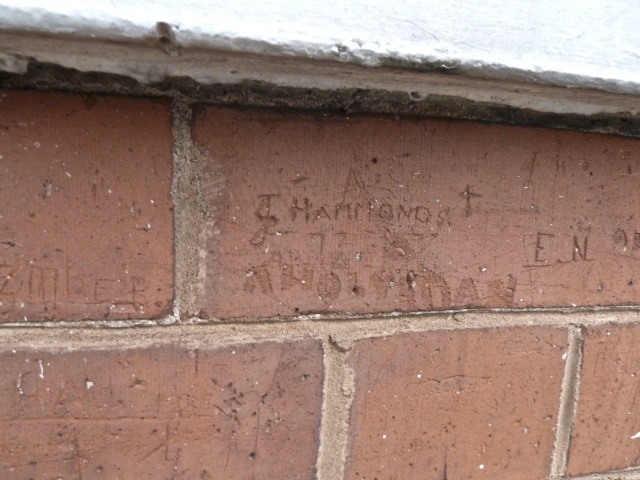 Readers who’ve been hanging around here a while will remember the post Persistence of Memory, where I spotted – and made some attempt at identifying – the names scratched into the soft terracotta bricks of the former Warreners Arms pub, on the corner of High Street and Ogley Road, Brownhills. My grandad and family lived in Ogley Road, 1930,40,50 I started school there, the surname is Holyman. I’m sure the scratched writing in the wall is Holyman rather than Holyday. There were at least 12 children in the family, some of the holymans live in Brownhills still. How do i join your group please, I have so many memories as do my sisters. Dorothy is quite right – the legend does say Holyman. How on earth did I miss that? She goes on to say the same in a later comment that day. I’d just like to say to Dorothy that we’re all interested in anything you’d like to say. This isn’t a group, but a blog anyone can comment on, and please feel free to do so. Alternatively, you can send me an email at BrownhillsBob at Googlemail dot com. You’ll find a welcoming bunch of folk who are always ready to jump in with research and memories. I pulled the original photo out of my collection, of the Holyman name. I must have had the wrong glasses on when I looked at that. Must see if I can get a better picture. So, they question is, what do you know about the Holyman family? This looks like A. Holyman – who was he or she? My gratitude to Dorothy, and welcome aboard! Whilst we’re about it, I had a n enquiry a few weeks ago from one Patrick Darcy. He’s looking for Patrick Heinz. I am looking for Patrick Heinz of Brownhills. I am 61 and he would be about 62/63, he went to Cardinal Griffin school Cannock. Wonder if you know him at all. If you know Patrick Heinz, please ask him to drop me a line and I’ll hook the two chaps up. Please don’t post specific details publicly, mail them to me at BrownhillsBob at Googlemail dot com (It’s always, always best practice to ask the person being searched for their permission to pass details on – they may not wish to be found). I think the row of terraces near Streets Corner – now demolished – may have been called Woodbine something – maybe ‘cottages’ or ‘terrace’. 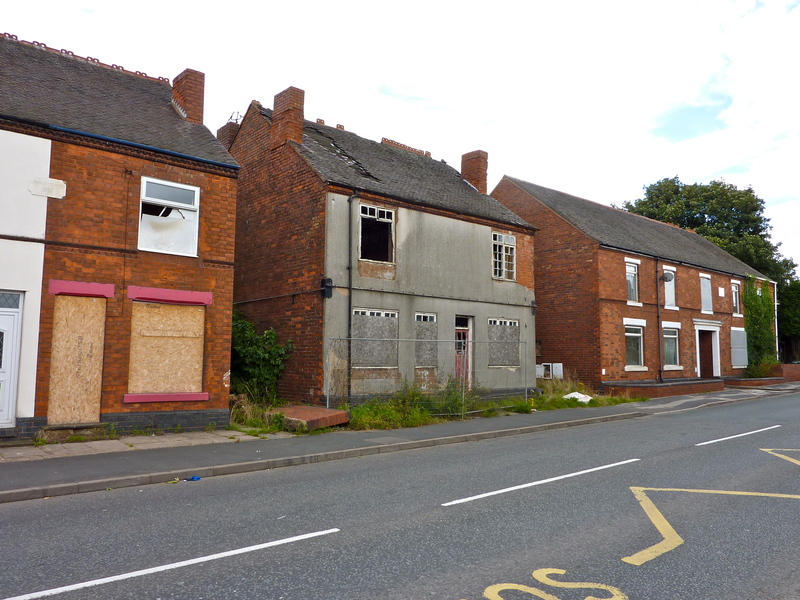 Reader Pam also commented here last week – note we have discussed several Woodbine Terraces in Brownhills before. It seems to have been a popular name for a while. My name is Pam Smith. I am currently doing a family tree and have come to a small road block. I have very little information about my mothers birth father. He came from Brownhills and the only address she had was 7 Woodbine Crescent Brownhills. When I look at Ancestry.com.au there is little reference to such an address. I was wondering if the address may be listed as something else. His name was Charles Harrison with a sister called Clarice. Thank you if you can give me some insight into this address being listed as something different. I should add that even though I am in Australia Mum was born in Oxford. In the same vein, I had a mail from Peter Chadbund, now in Buckinghamshire. Peter very kindly offered me a copy of the Jack Harrison books I’d been seeking, and told me some more about them, which I’ll raise in a further post. Fortunately, so many readers helped with scans, I didn’t need to take Peter up on his very generous offer, which I did appreciate very much all the same. Peter knew Jack Harrison quite well at the time of the publication of his books, but subsequently lost touch, and wonders if anyone knows what became of Jack? Recently doing some family history research online I discovered that my great great grandfather, William Chadbund 1821-1895, lived in Wimblebury and was at times listed in the censuses of 1871 and 1881 as a grocer and farmer respectively. There are no specific addresses given, only ‘grocers’ and ‘farm’. That is as far back as I have been able to trace that branch of my family, so I would love to know more about that particular ancestor and the farm and shop (his son, Henry, is listed as a miner). My great grandfather was a ‘stationary engine driver’ – presumably at one of the local collieries as was my grandfather. If you could help with the above I would be most grateful. So the question is, can anyone help with these enquiries? There were 9 houses in Woodbine Terrace, Chester Road, so there would have been a number 7. There were 2 births registered for Clarice Harrison 1923 Sep Cannock 6b 848 and Clarice M J Harrison 1913 Sep Cannock 6b 1053. Cannock is significant because IF (and it’s a big if) she was born at Woodbine Terrace above, being in the parish of Norton Canes, it would have been registered at Cannock, rather than at Lichfield, as for other places in Brownhills. Harrison, although far from the least frequent of English surnames seems relatively scarce in the censuses for Brownhills; only one family in Church Street 1901. If you can give me a bit more to go on, I’m quite happy to do some more research. Thanks, Andy. As thorough and on-the-ball as ever! In further investigation it appears that she was born in 1923. The information below from oakparkrunner with family names in it was able to unlock some of the story for me. Thank you. If there are any other names you would like to check, just let us know. There is a mention of a Clarice Harrison at the Congregational Anniversary Service at Brownhills, having performed a solo in the Choir. There are several mentions of the surname Holyman. If any initials can be given I will check. Holyman’s in Aldridge too. In fact one A Holyman was present at the death of my Grandfather in Station Road Aldridge in 1937. November 1933 there was a Dorothy Chadbund amongst the prizewinners, Form Vb, Lichfield Friary School. She also received another prize for holiday work. Also a mention in a play in 1932. A mention in April 1933 of a Miss Dorothy Chadbund giving a solo at the Trinity Methodist Guild, Chasetown. And again a mention in Chasetown Methodist circles as Miss Dorothy Chadbund in 1940. Charles Harrison did live in Woodbine Terrace Chester Road Brownhills next to the old Fire Station. His father was Jack Harrison. Jack Harrison’s Father was Daniel Harrison. Daniel’s father was Lester Harrison. My partner, Mavis Harrison’s father in law was William Harrison, brother to Jack. Mum did write to the Brownhills address about 1947. And got a reply from Clarice his sister that said he was in Germany in the army. He was in Oxford for work about 1930 or 1931 and that was were he met my grandmother . Unfortunately not a lot more to go on. I am using ancestry .com.au and the records do not always have enough information to go on, Thank you for the information that you have put here I will see if I can find any more information . Is there a chance that Jack Harrison that wrote Black Diamonds was the same Jack that was Charlie Harrisons father referred to above. Hi, a bit late on the reply, but my grandad was Abraham Holyman born in 1902, passed away 1997. He lived on the Lichfield Road in Walsall Wood and their house was demolished to make way for the old Oak Park leisure centre. He lived for the last 40 years or so of his life it Stewart Road in Walsall Wood. I have no idea whether this has anything to do with him, he was a miner until the early 60’s when all of the local pits closed down, he used to cycle over to Lea Hall colliery over Rugeley. They doe mek em loike that ennymower. many thanks for your comment….Was Abe related to Harold Holyman, who was connected with the Walsall Wood Football Club..?